Dr. Mike Woo-Ming knows the impact autism can have on a child and family. One of his two children is autistic. Dr. Mike is passionate about helping to make a difference. He has created an annual fundraising campaign called Marketers on a Mission. The purpose of the campaign is to raise funds for the Pioneer Learning Center, a school that helps children on the autism spectrum including Asperger's, ADD, and other social integration disorders. To encourage your donation, Dr. Mike has gathered together more than 40 top internet marketers who are giving away some significant incentive gifts. Last year I donated to the Marketers on a Mission campaign. I was surprised at the number and quality of the gifts I received. This year I joined the internet marketers by adding my own product. Consider helping several autistic children by going to http://www.MarketersOnAMission.org and making a donation. Then enjoy the available gifts. It truly is a win-win situation. 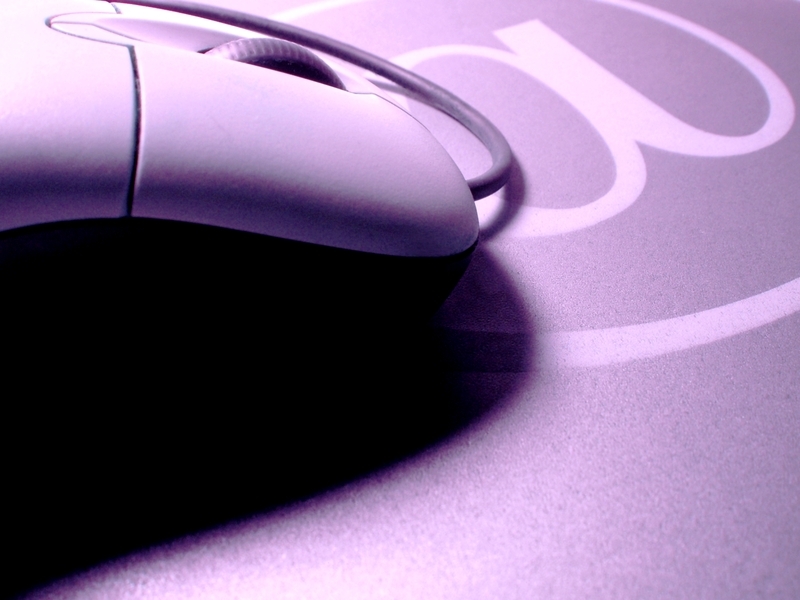 How important is an effective online presence for a nonprofit organization? Two-thirds of people donating to a new nonprofit will visit that nonprofit's website before making the donation. This includes donations being made by check. Obviously, a nonprofit organization's website needs to meet the needs of these potential donors. The website needs to have a professional look and feel that reflects the personality of the organization. Key information and the ability to donate should also be accessible from every page. It is important for nonprofit organizations to have an online presence. It is also important to reflect a professional image to potential supporters. Don't scare your online visitors away. Make sure your website encourages them to get involved. Most nonprofit organizations could be more effective by trusting and empowering their volunteers. This is one theme that was evident at the Converging Campaigns panel discussion. Several of the panel members discussed the need for organizations to effectively target potential and current supporters. One of the best ways mentioned was through the personalized message of individuals (volunteers). I will discuss the importance of using these type of techniques called micro-campaigning and micro-targeting in a future post. Brian Rubenstein, Associate Director of Nationwide Grassroots, American Cancer Society Cancer Action Network, was the most vocal about the need to empower volunteers. He made it clear that it was important for organizations to trust their volunteers. For example, traditional approaches of contacting Congress are becoming much less effective today. Because it is difficult to determine whether advocacy emails are coming from individuals or being sent by the organization, the impact of an e-mail campaign is reduced. However, a personal visit by volunteers to congressional offices can have a significant impact. This means it's important for an organization to trust and empower the volunteers not only to support online campaign efforts but offline as well. Using online tools to engage these volunteers can be a very effective method in preparing them to be an advocate. Suggested tools were mentioned throughout the day including email, text messaging, MySpace, and Facebook. The format of the web site could still be controlled by the nonprofit organization. The content could be monitored easier by the nonprofit organization. For some organizations, this may still seem too risky. Brian indicated the volunteers are going to write about the nonprofit even if they are not provided these tools. He also said that most people, including government officials, know that volunteers might make mistakes. The passion and stories of those volunteers to the cause is what is important. So the tactic of providing online tools to volunteers can actually be less risky than doing nothing at all. 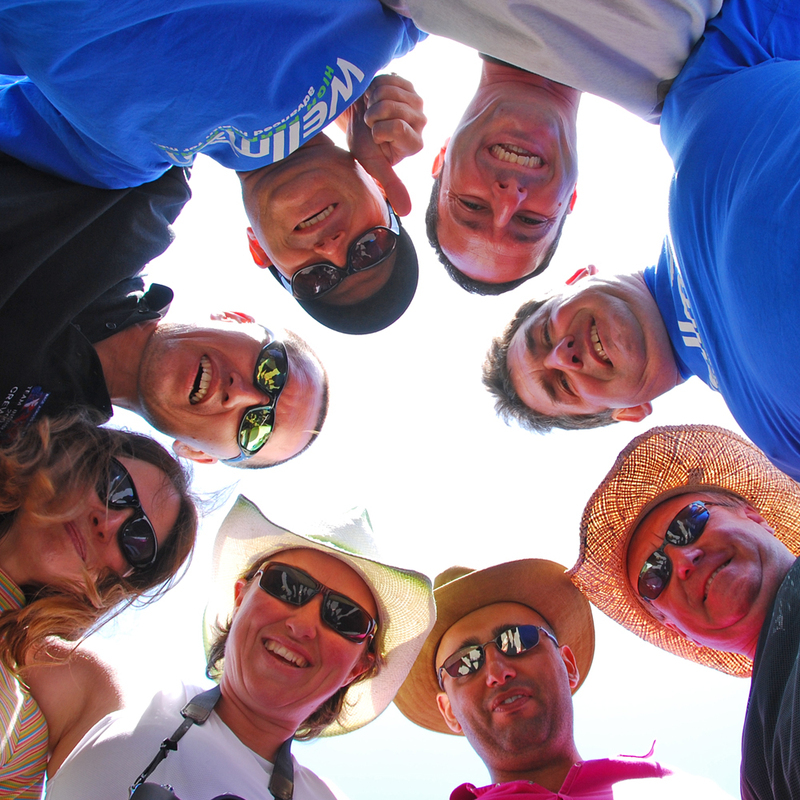 It is important that nonprofit organizations start trusting and empowering their volunteers. Volunteers need to be viewed as an extension of the organization's staff and a critical resource for achieving the organization's mission and goals. Volunteers need to understand that their voice is becoming more important than ever in today's world. It is important to take action and start making a difference. 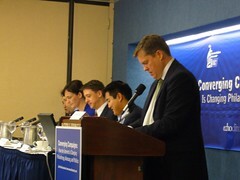 Yesterday I had the privilege of attending the Converging Campaigns panel discussion held at the National Press Club in Washington DC. Convio and ViaNovo made the event possible. The Converging Campaigns panel discussed how the Internet, social media and technology are changing the worlds of philanthropy, advocacy, and politics. A significant amount of useful information was communicated during the hour and a half. I shouldn't have been surprised, because the speakers were top leaders in their field. It was exciting to meet several new people at the event who are working in the philanthropic arena. in addition to the traditional media, I talked with representatives from nonprofit organizations as well as representatives from technology and service companies supporting nonprofit organizations. Jessica Hood and Jordan Viator were a couple of the first attendees I met. They both work at Convio. Jordan is a fellow blogger and the one who sent me a personal invitation to attend. My thanks to both of them for making the experience a great one. Over the next few days, I'll be writing about some of the interesting things I heard at the event. Be sure to return to the Everyday Giving Blog to learn more about the future of philanthropy. Tags: American Cancer Society Cancer Action Network, converging campaigns, convio, National Press Club, Non-profit organization, nptech, vianovo, Washington D.C.
IMG00101, originally uploaded by rogercarr. The "Thanks Mom" marrow donor registry campaign ends on Monday, May 19. During the campaign, you can join the National Marrow Donor Program Registry for free until they meet their goals. Costs are covered by generous partners and contributors for the first 46,000 people who join the Registry (this includes the first 10,000 who join online). 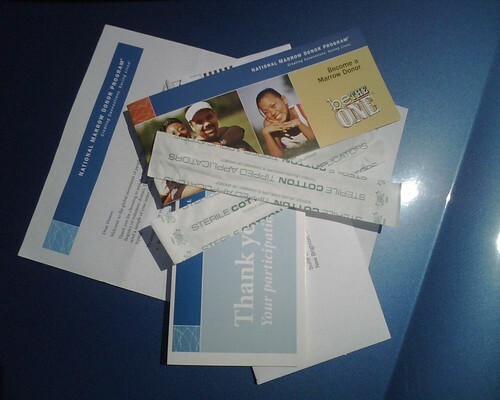 The photo is the donor kit I received in the mail after filling out an online registration form. It took less than 5 minutes to read the directions, complete the procedure and send it back to be registered. Go to http://www.marrow.org for details on how you can participate. Join me in giving hope to someone in need. 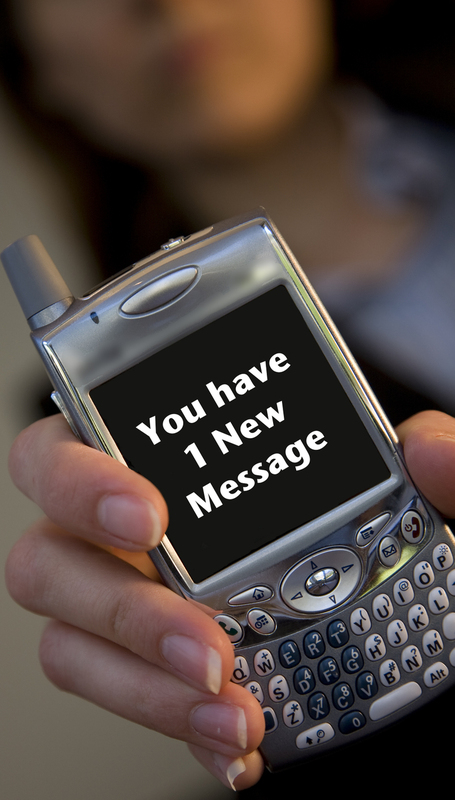 Will You Text Message Your Next Charitable Donation? During this year’s SuperBowl, Mobile Accord worked with the United Way to launch a commercial proving out the concept of mobile donations. Additional experimental campaigns based on mobile donations have also happened recently. 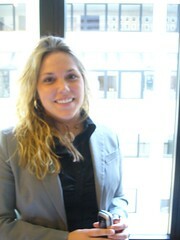 They are donations made to nonprofits through the use of a mobile device, such as a cell phone. Mobile Accord has launched a new service at mGive.com that enables nonprofit organizations to create and launch text message donation campaigns. The donor just sends a short text message to a specific location and the donation is added to the donor's mobile phone bill. They have already worked with ASPCA, Amnesty International, Alicia Key’s organization- Keep a Child Alive, and many others. Have mobile donation campaigns shown promise? Mobile Accord clients like United Way deemed their campaign “phenomenally successful” and the Alicia Keys’ Keep a Child Alive campaign routinely raises thousands each night that she has a concert. Why are Mobile Donations Important? Making a donation by sending a simple text message is convenient. This convenience is available to the 250 million mobile phone users in the United States alone. I believe there is another important reason this technology is critical for nonprofits and it will become increasingly important over time. 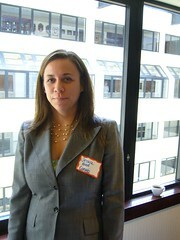 I attended a session on Generations and Social Media at PodCamp DC last month. 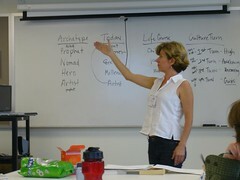 Jessie Newburn was an energetic and knowledgeable speaker on the topic. Jessie taught that Millennials (born between 1982 and 2000) are all about being mobile and staying socially connected through their mobile devices. This is also a very large group. Reaching Millennials with opportunities to support nonprofits is important. Donating using a mobile phone will be natural for them. Encouraging their network of friends to also participate will also be a natural act. If your nonprofit organization is interested in finding new ways to raise funds, go to http://www.mGive.com and determine if mobile donations are for you. A few years ago I attended an auction to raise money to support the teachers at my son's school. The auctioneers were mesmerizing. The participants were generous. I remember a flag going for more than $1,000! The flag was small. It was to be displayed by parents on their car at the school. It allowed the parent to go to the head of the line when picking up his or her child. That was the only benefit the flag provided. Was the flag worth more than $1,000? Of course not. 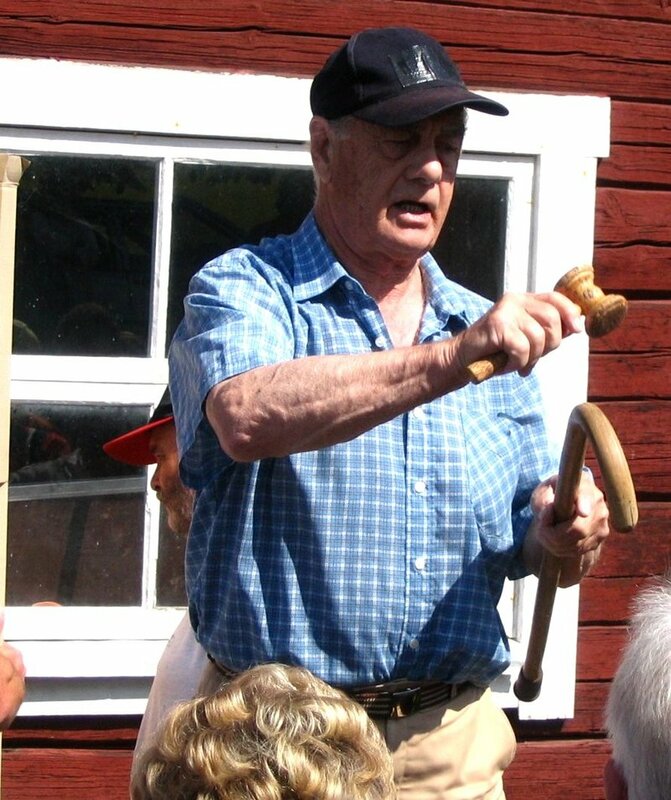 Most of the items at the auction were sold for many times their market value. The participants understood the auction was a fundraising event. They understood the purpose of the auction was to raise funds for a good cause. The purpose was not to find bargain prices. Auctions can be a great way to raise money for a nonprofit organization. But only when the participants are in the proper mindset. People need to compete with each other to overpay for items. Seth Godin recently wrote about this on his blog. He suggests that you need to set the proper tone right from the start. Seth describes a scenario where a few "stooges" are enlisted from the audience to ensure the first item sells for much more than the actual value. When the winner(s) receive applause, the tone is set and the rest of the participants are ready to outdo each other. I like this approach. It fosters an environment that encourages overpaying for auction items. If you're considering a charity auction in the future, focus as much on creating the needed environment as you put into finding items for the auction. Be creative when finding items to sell. Items that are fun and whimsical may draw more excitement and larger bids than items worth much more. Items that hold sentimental value can do the same. What is important is how much money was raised for your cause, not the value of the items sold. Jen Lemen is my favorite artist for fun and inspiring artwork. One of her posters I own reminds me every day of the possibilities each day can bring. 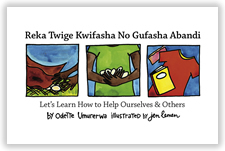 Jen has now teamed up with author Odette Umurerwa and created a book with a message of self-confidence, determination and hope to encourage Rwandan and American girls (along with adults of all ages) to make the world a better place. It is based on an inspirational true story. 350 preview copies of Let's Learn How to Help Ourselves & Others have been made available at $10 this weekend only. There are only 43 left in stock at the time I am writing this. You need to click here and order your copy now. Note: Proceeds from the sale of this book this weekend will go directly to Odette Umurerwa, the care of her daughter Grace and the Girl Power Rwanda Trip scheduled May 18-27. In Forces for Good , Leslie R. Crutchfield and Heather McLeod Grant discuss the top six practices of high-impact nonprofit organizations. Their findings were the result of a two-year study. One of the six practices of high-impact nonprofit organizations is collaboration with other nonprofits. Viewing other nonprofit organizations as the competition to work against can be harmful to being the most effective. The study found that high-impact nonprofits build nonprofit networks and help the competition to succeed. 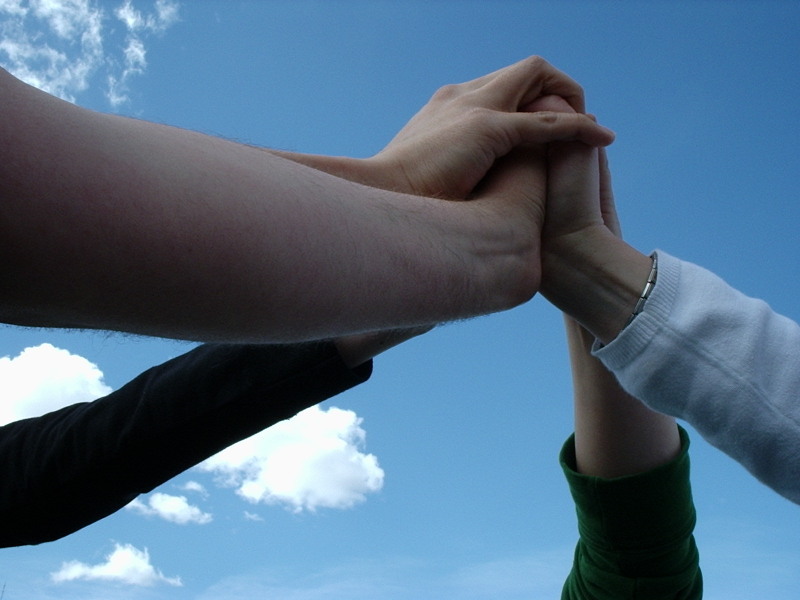 Collaboration is a key ingredient to maximizing the impact of your nonprofit organization. That should be a huge incentive to start building your network. Do you want an additional incentive? The Lodestar Foundation has just launched a competition called The Collaboration Prize. A $250,000 award will be presented to the collaboration that best puts cooperation above competition. If you have a collaboration that should be considered for the award, go to http://www.thecollaborationprize.org for all of the competition details. What nonprofit organizations do you currently consider your competition that you should start working with?